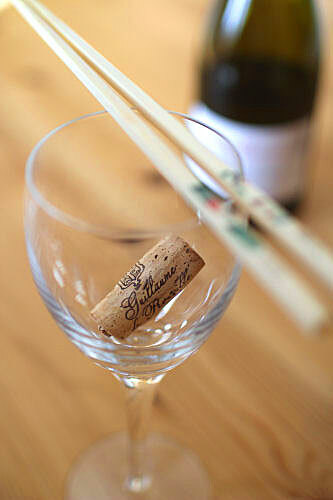 My latest wine challenge was quite interesting and very timely (given we're in the middle of Chinese New Year!) 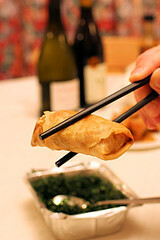 - can Côtes du Rhône wines be paired with Chinese takeaway food? 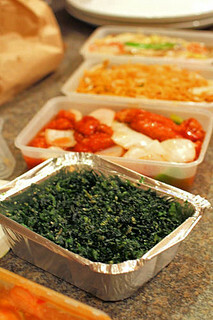 I have to admit that I've not eaten Chinese takeaway food for years - after all, you can make a fabulous stir-fry at home, and Chinese ingredients are easily accessible in all supermarkets nowadays. I asked around on Twitter to see where I might find a good restaurant in my part of the woods and there were some good recommendations, but had to go to the closest one in the end due to never-ending poor weather. I cannot lie, I was a little disappointed - thank goodness for the wine! 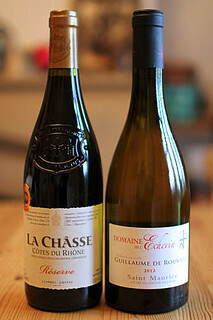 I was sent two wines to try with the food, a red one - La Chasse Côtes Du Rhône Reserve (Sainsbury’s, £7.99) and a white - Saint Maurice Côtes du Rhône Villages Blanc de Rouville, Domaine de l'Echevin 2012 (The Wine Society, £12.50). The Côtes Du Rhône wine area in southeast France has been producing wines for at least 2000 years, with the hot and sunny climate producing a more constant temperature than that of other French wine producing regions. Over 450 million bottles of wine are produced each year (14% of French wine production); with 80% red, 14% rosé and 6% white. 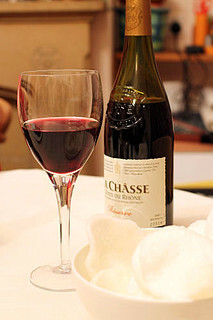 The La Chasse Côtes Du Rhône Reserve was a light, fruity, red, and matched the less sweet dishes. 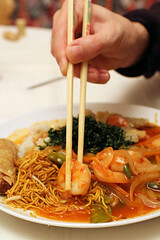 It perked up the prawn crackers and was a great accompaniment to the king prawn delight - a spicy Szechuan style dish. 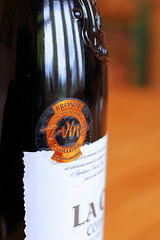 It's also a good wine to serve with mature cheeses as I discovered the next day! The Saint Maurice Côtes du Rhône Villages was a very refreshing and zesty light white wine, excellent with all the Chinese dishes, but particularly the sweeter dishes of crispy shredded seaweed and sweet & sour chicken. A great all rounder of a wine! There was nothing terribly wrong with the food, it felt like stepping in time by 20 years with exactly the same sickly sticky sauce on the sweet & sour, same flavour gravy on the vegetables.... I don't really know what I had been expecting! 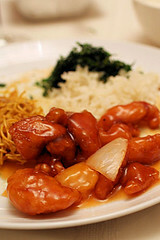 I was thinking that the food would be as good as mine and hoping that it would be better. Having said that, we were hungry and most of it got eaten. I know it's a bit slobbish not to put the food into serving dishes, but it's a takeaway and I did get out the chopsticks and decent wine glasses! 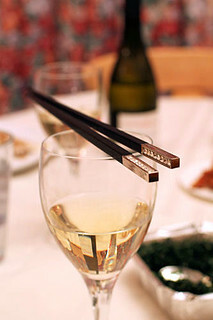 My favourite dishes were the plain chow mein noodles, which bought out the lovely aromatic scent of the red wine and the crispy shredded seaweed - a great match for the sweeter white wine. The most disappointing dish were the spring rolls, nice and crisp on the outside but quite mushy non-descript vegetables inside. 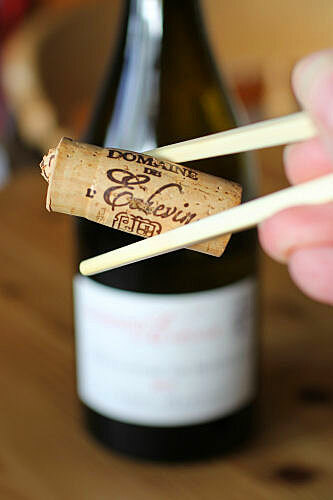 Next time you order a Chinese takeaway, don't reach for the lager or tea, try some fabulous affordable Côtes du Rhône wine. Dare I say to pop the red wine in the fridge for half an hour, especially if you're not ordering the sweet dishes, a chilled glass of Chasse Côtes Du Rhône Reserve is the perfect partner for your food! Disclosure: I was sent two bottles of Côtes du Rhône wines to see how they pair with Chinese takeaway food, all views are my own.